Microsoft's announcement they would not be developing new features or hardware for Windows 10 Mobile, makes Android the clear choice for enterprise data collection. Retirement dates for Windows are approaching fast with WEHH in January 2020 and Windows CE in April 2021. Let ADI help answers all your questions. The new MC9300 mobile computer from Zebra is here. This Android device is built on the tried and true MC9000 platform, providing the ultimate in workforce productivity and operational efficiency in your organization. Migrating to Android couldn’t be easier - you can run your existing TE apps right out of the box. Zebra’s All Touch Terminal Emulation software makes it easy to convert your current TE app to a more modern and intuitive graphical user interface. With a touchscreen and a keypad, workers can transition to an interactive version of your TE apps at their own pace. You can choose the keypad that will maximize data entry simplicity — and you can swap keypads right in your facility, allowing you to update keypads to meet the needs of new apps, or repair a broken keypad without sending the device to the service depot. With LifeGuard™ for Android™, your devices are secure every day they are in service, you’re always in control of the update process — and you get support for the next two versions of Android (P and Q). Larger advanced 4.3 in. WVGA touchscreen - workers can view more business data, easily read the screen indoors and outside, and interact with the screen, even when it’s wet. With Bluetooth Low Energy (BLE) 5.0, you get twice the speed and four times the range, yet your Bluetooth peripherals require less power. With integrated NFC, a simple tap will pair the MC9300 with Zebra’s ring scanners, mobile printers, headsets and more. When it comes to scanning, the MC9300 does it all — short, mid and long-range capture of 1D and 2D barcodes in any condition, as close as 3 inches to as far as 70 feet. And with the DPM model, you can even capture the most challenging direct part marks, quickly, easily — and cost-effectively. Make sure your workers know when a scan is successful with the optional vibrate mode — ideal in noisy warehouses. The optional 13 MP color rear-facing camera makes it easy to document proof of condition, proof of compliance and more with the simple press of a button. Considering Visible Light Communications (VLC), the latest in locationing technologies? - the MC9300 is ready to support it with the optional front facing 5 MP camera. The MC9300 doubles as a walkie-talkie right out of the box, since Zebra’s PTT Express is pre-loaded and pre-licensed. Scanning, battery life and durability have all been limiting factors when considering using consumer devices for business. Problem solved! The new TC25 Rugged Smart Phone from Zebra addresses these short comings and more. And all at a price point that won't break the bank. The Dolphin CT60 is the latest device from Honeywell and one of the first offered on the new Mobility Edge Platform. With Mobility Edge, the device is covered for the next 4 Android updates (N-Q), extending product life cycles and lowering TCO. Other features of the CT60 include 2D imager, durable touchscreen display that can be used with finger, glove or stylus and advanced network connectivity good for large file transfer and video streaming. The MC3300, the next generation of the highly successful MC3000 series, offers everything you need to run your current terminal emulation (TE) applications right out of the box — or reformat to create intuitive screens that utilize touch to simplify the user experience. When it comes to features and options, this best-in-class device delivers, offering the lightest and most ergonomic design, the biggest touchscreen, the most keypad options, unmatched scanning performance and range, the fastest processor, the most memory, the fastest wireless connections and more. The revolutionary design of the Zebra Technologies' TC8000 increases productivity an average 14 percent. See Zebra's white paper detailing the results of their research! 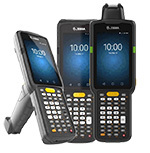 Zebra / Symbol - As part of the MC9000 Series, the MC9200 is designed for all-day business use in the toughest environments—every day, millions of users around the world count on their MC9000 Series mobile computer to better manage inventory in warehouses and manufacturing plants even in the most demanding environments. Zebra / Symbol - Now with more options, the MC3200 is a cost-effective, lightweight and rugged mobile computer that provides the tools your workers need to complete inventory-related tasks in seconds, from the store sales floor to the loading dock. Our most popular mobile computers for over 10 years, you get a tough and tested mobile computer you can trust to take your inventory management efficiency to the next level. Honeywell - The CK71 is the no-compromise, next-generation ultra-rugged mobile computer that achieves true functional agility with the perfect balance of ruggedness, duty cycle, and ergonomics for the most demanding warehouse-distribution and manufacturing environments. Honeywell - Featuring a highly adaptable design, the CK3X enables a variety of in-premise applications to reach their full workflow performance potential and improve their operational metrics, simplify IT support and control operating costs. Zebra / Symbol - The TC55 is a pocket-sized computer that has it all; Smartphone ergonomics and the durability your require for your business needs. Built for enterprise environments, the TC55 supports enterprise class data capture, easy to see screen for use both indoor and outdoor, IP67 rating, and advanced audio that delivers 4X the loudness of popular smart phones. Zebra / Symbol - New to the line of Zebra mobile computers is the TC75. Perfect for use in Field Service, T&L, Route Accounting and Public Service applications, the TC75 delivers the best of both worlds, a rugged design built to handle life in the field with a full complement of enterprise-class voice and data capture features in a device that is every bit as refined and easy-to-use as consumer smartphones. The TC75 — the right device makes all the difference. Honeywell - The Dolphin 75e hand held computer is a versatile multimodal device that delivers significant operational gains and flexibility for the enterprise. Featuring a sleek, pocketable design and yet durable enough for tough work environments, the Dolphin 75e device is efficient, easy to adopt and offers enterprises a lower total cost of ownership than traditional single-purpose devices. Honeywell - The Dolphin™ 70e successfully marries the size, style and usability of a consumer device with the reliability and longevity of a traditional rugged hand-held. Engineered with premium materials and clean lines, the form factor of the Dolphin 70e elegantly lends itself to personal device usage while also meeting the challenges found in the unpredictable surroundings of the mobile enterprise. Janam - The XM5 is the latest in a line of rugged mobile computers from Janam. With a robust feature set, the XM5 is a versatile device suited for any application. Honeywell - The Thor VM1 vehicle mount computer, the ideal forklift computer, outdoes the competition with design breakthroughs. In today’s supply chain, the only constant is change. Disruptions, whether short-term like a forklift failure, or long-term like a natural disaster, are a fact of life. The supply chains best prepared to adapt to these disruptions will use mobile computing technology that gives them greater flexibility. The Thor VM1 provides unprecedented flexibility in a mobile computer. Honeywell - Ideally suited for warehouse, port and yard process automation, the Thor VM2 vehicle-mount computer builds upon the best-in -class Thor VM1, by offering an additional form factor, but still delivering the same reliable performance you've come to expect in your supply chain applications. The Thor VM2 offers businesses a comprehensive route to dramatic operational improvements. Honeywell - Designed for use in the toughest distribution center environments, manufacturing facilities and freight operations, the Thor VM3 is the industry’s most capable full-size vehicle-mounted mobile computer, delivering unmatched operational efficiency. Zebra - VC80 - With full Windows support, the data your operators need to complete tasks faster and more accurately is always at their fingertips. The rugged design built to handle all day vibrations, pounding and your toughest indoor and outdoor environments. And with the compact design and flexible mounting options, the VC80 will fit easily your vehicles – even in the most space constrained forklifts, clamp trucks, yard mules and more. The VC80 – real desktop power for your vehicle operators. Whether your material handling vehicle operators are moving incoming shipments in a warehouse into inventory, containers on and off ships and trains or baggage to and from departing and arriving planes, you need to achieve maximum throughput and accuracy. With the VC80, you will. Zebra -The VC70N0 is built to handle the demands of life on the vehicle. Built for industrial environments including distribution, manufacturing, transportation and retail/wholesale, the VC70N0 accurately tracks items throughout your organization with a quick scan of the bar code leading to increased accuracy and productivity. Zebra's WT6000 is the next generation in wearable computers. Built on Android OS, the WT6000 sets the industry standard for rugged design in its class — it’s dust-proof, spray-proof and built to handle drops and subzero temperatures in the freezer. Add the hands-free ring scanner and headset of choice: the RS6000 1D/2D Bluetooth or RS4000 1D corded ring scanners, and the HS3100 Bluetooth or HS2100 corded headsets. Want a complete wireless solution? With support for NFC in the WT6000, it’s easy — just tap to pair the RS6000 Bluetooth ring scanner and HS3100 Bluetooth headset with the WT6000. With Zebra’s TekSpeech Pro 4, you can quickly and easily create a multi-modal speech-directed picking application that marries speech with all the data capture capabilities of the Total Wearable Solutions. The result? A 15% boost in worker productivity and 39% fewer errors than typical voice-only solutions. Zebra - The WT41N0 wearable computer, is a hands-free system that allows workers to process more packages in a day than ever before. With a full mobile computer on their arm and a ring-style scanner on their finger, workers can collect a wealth of information about the items they are handling in just seconds. The result? Increased workforce productivity and throughput, more satisfied customers and cost-effective compliance with traceability regulations. Honeywell - Using the rugged enterprise class Dolphin 70e/75e with purpose-built wearable accessories provides a new approach to enabling hands free operations. The large display, flexible touchscreen keypads, and modern architecture allow more user friendly applications to be easily deployed to quickly gain the productivity of hands free operation. Zebra - The ET50/55 marries the best of consumer-styling with all the enterprise-class features you need to increase workforce productivity, with a real business class return on your tablet investment. Your workers get the elegant personal tablet styling they want, while you get a durable tablet designed to last for years, exceptional battery power, enterprise-class first-time every time rapid capture of practically any type of business data, plus a comprehensive family of business accessories to easily customize a solution for just about any job. Zebra - The ET1 offers consumer-style sleek design and ease of use, with the durability required for all-day business use inside and outside the four walls. Enhanced Android operating system delivers enterprise-class security, flexibility and manageability over wireless LAN and wireless WAN networks. Janam - The XT1 rugged mini-tablet delivers all the technological advancements found in consumer devices with the mission-critical key features that enterprises require. In addition to Android™ 4.2 operating system, the XT1 offers enterprise grade security, integrated 2D scanning, 802.11a/b/g/n, 3G WWAN cellular technology, and a 5.0 megapixel camera . DT Research - Rated IP65 for water and dust resistance and MIL-STD-810-6, for shock and vibration protection, the DT395CR is a rugged tablet built for the harshest environments. The device supports either Windows 10 IoT Enterprise or Android 5.1 operating systems. XploreTech - The XSLATE D10, driven by Android 5.1 Lollipop, is a rugged tablet that stands up in the toughest environments. The full 10.1” multi-touch screen is viewable in direct sunlight. And the D10 is secure with lock-down feature when used with the V2 Vehicle Dock and protected by auto-disk encryption. Watch the video to learn more! Mobile Demand - If you're looking to increased productivity in your enterprise, the xTablet T1600 is for you. This Windows tablet offers numerous features including dual color cameras for photos and video and optional 2D imager or HF RFID reader, Bluetooth and 4G LTE cellular. Whether you’re in manufacturing, warehousing, field service, or transportation and logistics, the xTablet T1600 is a good choice. This topic continues to be hotly debated. The real answer is "it depends" on a number of factors. Here are some resources to help guide you to the solution that's best for your organization. If you adopt a BYOD policy, here are some IT issues to consider. Keeping your devices clean is important. It improves usability, safety, and productivity. There are two types of wear on your device, Physical Wear, and Corrosive Wear. Physical wear is the deformation or removal of material from physical contact. This happens by a common occurrence called three-body abrasion This involves the mobile computers external surface and the user hand or stylus and dirt or other contaminants between them. These rub away at the surface of the device and cause gashes and abrasions. Corrosive wear comes out of Physical wear. Once the devices surface has been damaged, these pockets are places where environmental chemicals and sometimes actual chemicals can collect. These chemicals begin to eat away at the device and without proper cleaning can lead to further degradation. Eventually these can cause issues with seeing the screen and can cause other issues as well. Cleaning your device can cause more harm long term as well. See our tips for cleaning your device properly.